In this Martin & Sylvia's Nature School story, "Setting the Table," Sylvia and Sofia are excited about drawing new spring forest flowers - but when they encounter lots of spring black flies, Daddy suggests they carefully gather some of the forest and bring it back home to draw inside. But what happens next is a surprise to all! We are joined by our media curator KC, who shows us her family's nature table and shares tips on how to create your own. 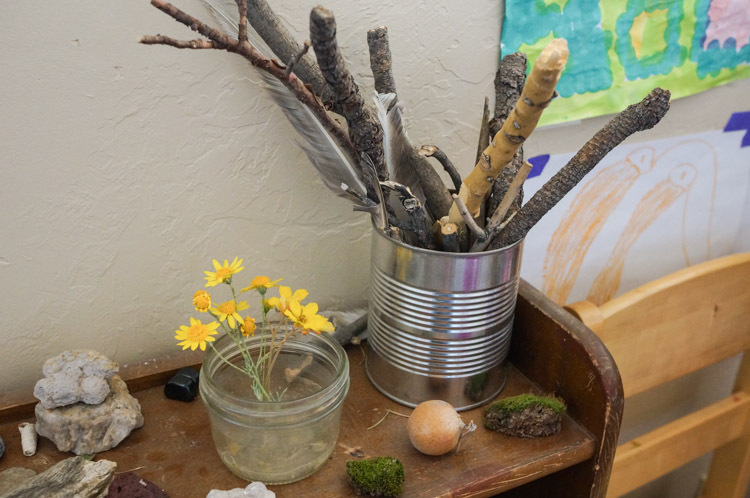 Creating a nature table is a great way to bring the outdoors inside and have a place to put all those treasures your little ones fill their pockets with. The items on the table can and will change with the seasons. A nature table is a wonderfully open concept and can fit any space. They can be big, like ours, or smaller, like Sylvia's plate on a stump in the living room. I've even seen small traveling nature "tables" kept in a box and spread out when there's time. For the purpose of this post, I will talk about a slightly larger space that can accommodate many different items. Our is actually a thrifted bookcase. The top shelf contians all the items my girls collect on a daily and weekly basis. The second shelf is for our View-Masters with animal and landscape slides, a cup of sticks, and a basket of pine cones. 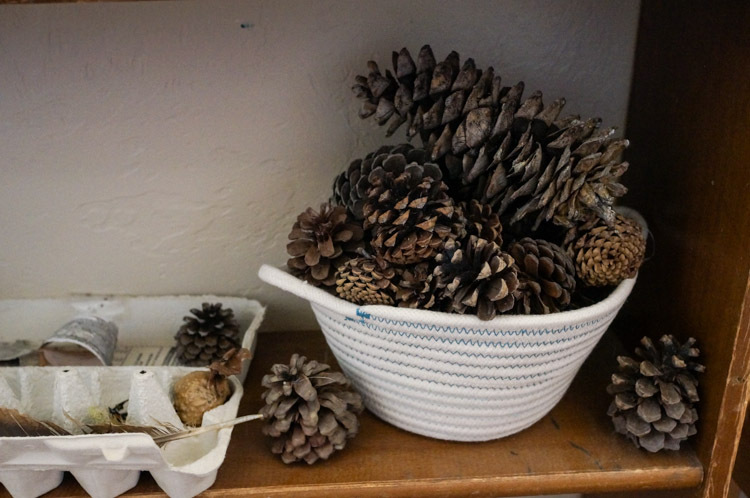 We use the pine cones and sticks for doing math work or building things. The egg carton is filled with special treasures gifted to us by friends from near and far. The bottom shelf contains our explorer bags. Each bag contains smaller bags and tins for collecting items that are fragile or very tiny, a magnifying glass, and a tiny note book and pencil. 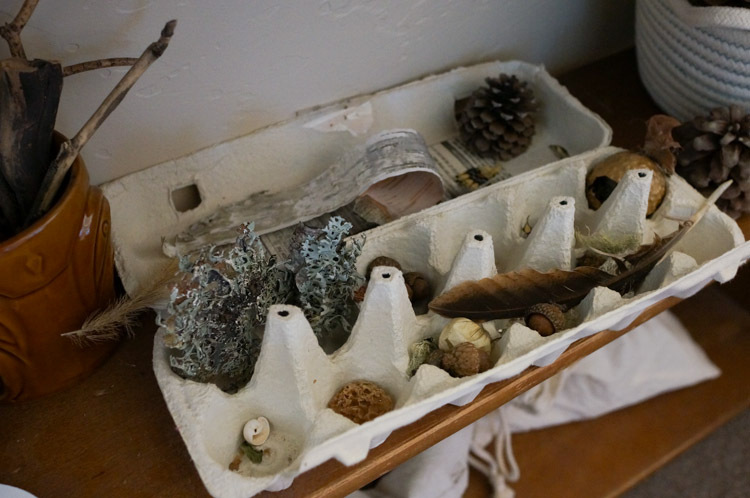 Here are some tips for creating your own nature table. Feel free to rotate items out as your table fills up. 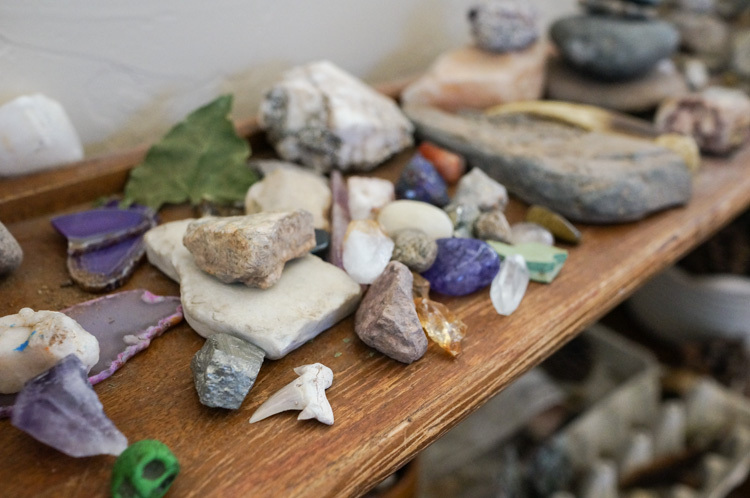 We often collect more rocks and sticks than the table can hold. 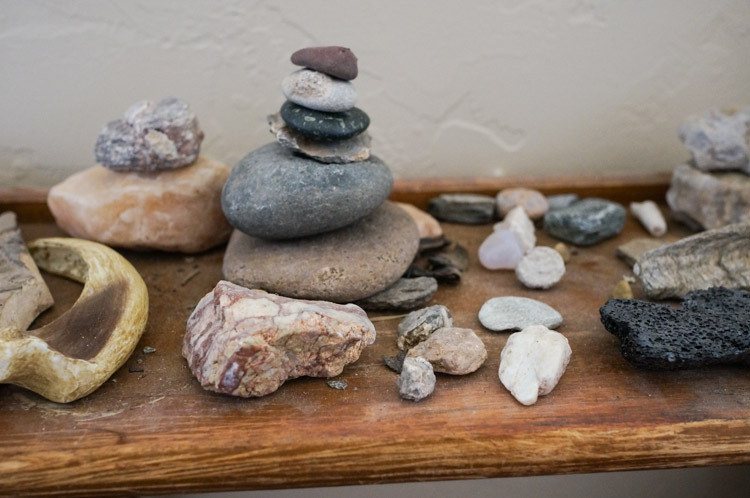 Just ask your child first if there is a special item they want to keep on the table (you don't want to chuck their favorite pink-striped rock outside, never to be found again!). 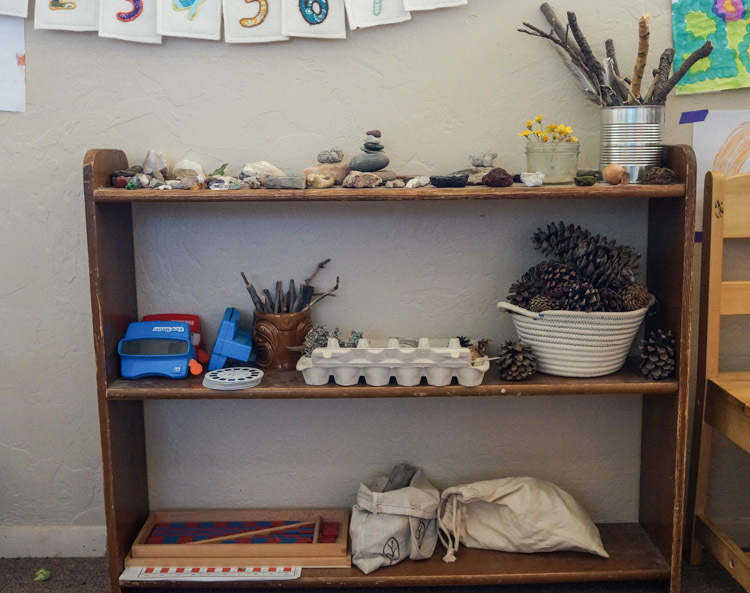 A nature table should be a place where children can also explore the things they have collected. So don't feel like it should be a gallery set up where you only look at the items. Let your child rearrange them however they wish. Feel free to add in pieces of art your child has made while observing nature, like Sofia and Sylvia, or books relating to nature topics they are interested in. The more your explore the outside world around you the more inspiring your table will become.